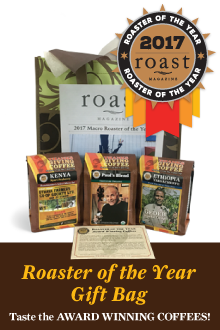 The 2017 Macro Roaster of the Year is Thanksgiving Coffee Company! Thanksgiving Coffee was chosen from a pool international artisan roasters, and came out on top through a blind tasting of three of our coffees. 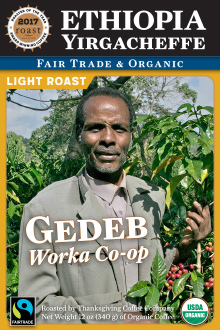 What started in 1972 when a couple of back-to-the-land California hippies decided they’d rather roast beans than string beads has grown steadily and organically into an organization that embraces its connectedness and responsibility in every aspect of its enterprise—a spirit Thanksgiving has in many ways pioneered in the coffee industry, as there were no predecessors to show its founders the way from "just a cup" to "a just cup." 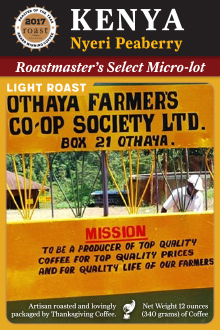 Learn more about our Roaster of the Year win on our blog, and try our coffee below. These three exquisite coffees won us the title Roaster of the Year through a blind tasting with Roast Magazine. Try them for yourself to find out why.